Origin and Habitat: North east of Vallenar, III region, Chile at about 86 km from the sea. Altitude: 1200-1400 metres above sea level. Habitat: It hangs on steep tall northwest-facing slopes in crevices on hard, grey-black, fractured igneous rocks along with other cacti such as Eulychnia acida, Miqueliopuntia miquelii, Cumulopuntia sphaerica, and Eriosyce confinis. 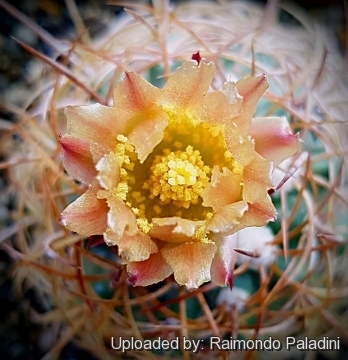 Description: Copiapoa coquimbana subsp. andina is one of the several local form of the very variable Copiapoa coquimbana with outstanding golden-yellow spines. This peculiar colouring make this plant easy to spot on the grey-black rock where it grows. 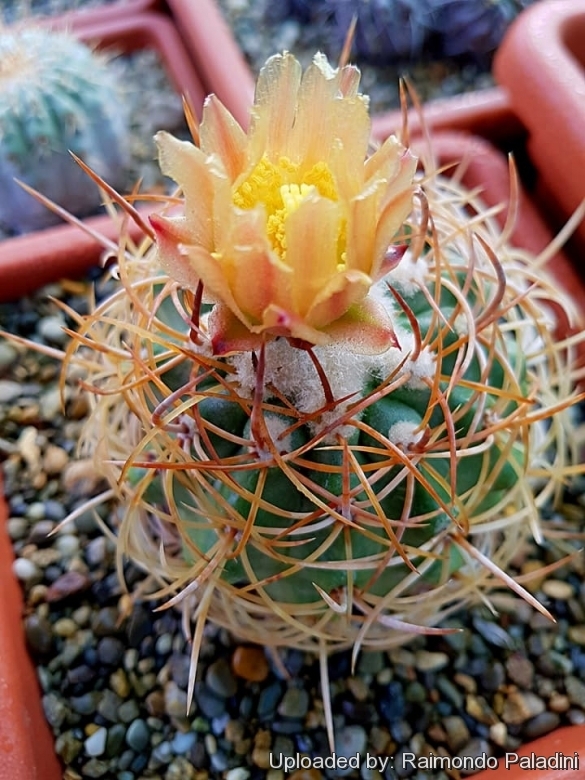 This golden appearance is not typical of any other Copiapoa. Habit: It is a heavily spined cactus that branches from the base, forming large clumps or cushions composed of up to 50 heads. Plants are quite homogeneous in appearance. Stem: Spherical, tight and slightly compressed, relatively soft, 9-15 cm in diameter and 8-30 cm tall, pale green with incomplete farinose coating, and crowned by a dense mass of long greyish-white wool, particularly at flowering time. Tubercles: Rounded, slight depressed in correspondence to each areole. Areoles: Apical, convex, almost round, covered with dense grey wool when young, later glabrous, about 5-6 mm in diameter. Radial spines: 9, round in cross-section, chestnut-brown quickly ageing into pale grey and then yellowish brown, stout, 2-3 cm long, about 0,8 mm in diameter, fairly slender or slightly curved, following the shape of the body and forming a large angle to the central spine. Upper lateral spines thinner than the lower laterals. Central spines: One thicker, upward curving, round in cross-section, 3,5-5 cm long and about 1,5 mm in diameter. Roots: Napiform, stout, light brown, up to 30 cm long and 3-5 cm broad slightly restricted at neck. 20 mm long, yellow. Stigma yellow, 9 to 14 lobes, 3 mm to 6 mm long. Stamens 8 mm to 12 mm long, yellow. Fruit: Round to elongate, about 15 mm in diameter and up to 2,5 cm long, pale olive green to reddish-brown, flowers remnants persistent on the seedpod . Seeds: 2 x 1,5 mm, black, shiny, surface with low and rounded bumps. 1) Ingrid Schaub & Ricardo Keim “andina & schulziana due nuove copiapoa - two new copiapoas” TAXA – cactus cileni Chilean cacti, Cactus & Co. – Editoriale - Cacti Guide 05/Nov/2008. 2) Schulz R. & Kapitany A., (1996). “Copiapoa in their Environment” Schulz Publishing. 3) Schulz R., (2006). “Copiapoa 2006,” Schulz Publishing. 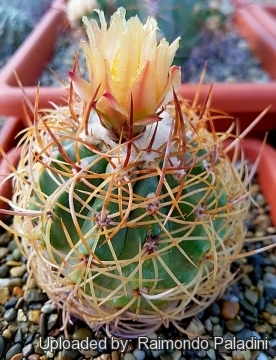 Cultivation and Propagation: Considering that Copiapoa coquimbana subsp. andina comes from a habitat with an extremely arid climate, they are remarkably tolerant of pot culture. These plants have taproots and are susceptible to overwatering. They requires also an appropriate air circulation. Copiapoas are summer grower species easy to cultivate.